The White House has issued a plea for help. 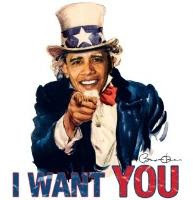 Yes, Uncle Sam wants YOU to report "misinformation" regarding the President's health care reform plan. I decided to help them. I reported WhiteHouse.gov and HealthReform.gov for misinformation. You can, too! I'll make it easy - just one simple click, and it will all be filled out for you. Click here to send your email to the White House.